Alloy 321 (UNS S32100) is a titanium stabilized austenitic stainless steel with good general corrosion resistance. It has excellent resistance to intergranular corrosion after exposure to temperatures in the chromium carbide precipitation range of 800–1500°F (427–816°C). The alloy resists oxidation to 1500°F (816°C) and has higher creep and stress rupture properties than alloys 304 and 304L. It also possesses good low temperature toughness. Alloy 321H (UNS S32109) is the higher carbon (0.04–0.10) version of the alloy. It was developed for enhanced creep resistance and for higher strength at temperatures above 1000°F (537°C). In most instances, the carbon content of the plate enables dual certification. Alloy 321 cannot be hardened by heat treatment, only by cold working. It can be easily welded and processed by standard shop fabrication practices. Grades 321 and 347 are the basic austenitic 18/8 steel (Grade 304) stabilised by Titanium (321) or Niobium (347) additions. These grades are used because they are not sensitive to intergranular corrosion after heating within the carbide precipitation range of 425-850 °C. 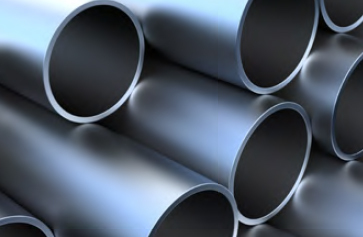 Grade 321 is the grade of choice for applications in the temperature range of up to about 900 °C, combining high strength, resistance to scaling and phase stability with resistance to subsequent aqueous corrosion. A limitation with 321 is that titanium does not transfer well across a high temperature arc, so is not recommended as a welding consumable. In this case grade 347 is preferred – the niobium performs the same carbide stabilisation task but can be transferred across a welding arc. Grade 347 is therefore the standard consumable for welding 321. Grade 347 is only occasionally used as parent plate material. 5 x (C + N) min.–0.70 max. Working temperatures of 2100–2300°F (1149–1260°C) are recommended for forging, upsetting and other hot working processes. Do not work this alloy at temperatures below 1700°F (927°C). Material must be water quenched or fully annealed after working to re-attain maximum corrosion resistance.